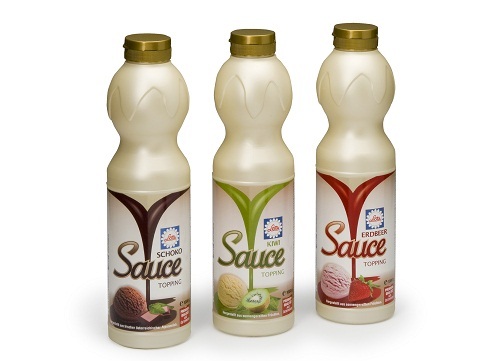 Carinthian dessert sauce specialist Liotta relies on the packaging competence of Greiner Packaging International for the long term. Liotta dessert sauces are filled while hot, which places high demands on its packaging. A new 800-milliliter bottle manufactured by the Austrian packaging specialist Greiner Packaging International meets these demands. Based on this successful new development, an agreement on long-term cooperation has been made. Kremsmünster/Wernberg, 24 May 2012 – “We had been searching for a packaging partner who offers high quality standards and can fulfil our challenging demands. At the same time, having a convenient geographic location was important,” says Liotta. The company opted for Greiner Packaging International and its Carinthian location of Wernberg. Since this spring, extrusion-blown bottles with a volume of 800ml have been supplied to Liotta from Wernberg. The new packs are made of a polypropylene (PP) that was specifically developed for the hot filling process. Liotta uses the most recent food technologies to keep its quality promise in regards to its dessert sauces. The core of production is a fully-automatic, microprocessor-controlled unit that combines efficiency, hygiene and accuracy. At the beginning of 2012, the company was certified in accordance with the IFS (International Food Standard). All production processes are monitored at relevant check-points according to the HACCP (Hazard Analysis and Critical Control Points) concept, and verified. The high quality standards of Liotta are completely in line with those of Greiner Packaging International. The packaging specialist also runs an HACCP program, and as a clear commitment toward hygiene and safety, Greiner Packaging International maintains certification under the BRC/IoP (British Retail Consortium/Institute of Packaging) standard, verified through independent auditors. After World War II Salvatore Liotta, a Sicilian, immigrated to Carinthia. In 1956, he opened up an ice cream shop in Villach, and 10 years later he established the ice cream manufacturer “Liotta-Eis“ in Mallestig. His son, Josef, took over the company in 1995 and has been successfully focusing on the making of high-quality dessert sauces. Now, Liotta combines traditional Sicilian recipes along with the finest ingredients using modern production technology. Among its customers are food stores and food discounters, fine-dining restaurants and hotels. Greiner Packaging International is one of the leading companies in the European packaging industry. In 2011, the company achieved annual sales of EUR 446.6 million – more than one- third of the total Greiner Group sales. Greiner Packaging International has a workforce of 3,103 employees throughout 32 locations.